The technologies of the concentration of solar power (CSP) are gradually gaining momentum as a stable source of alternative energy. 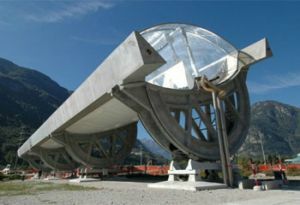 Here, a concentrating solar installation constructed by the Swiss company Airlight Energy is the last shining example. The installation is a build-up construction of several double extra strong reinforced-concrete foundations and super-lightweight flexible pneumatic mirrors. After several years of research and development, the company finally plans to commercialize the technology. As the company claimed, its concentrating solar installation can be built anywhere in the world with the application of local materials (for the build-up reinforced-concrete structures) and local manpower. The company’s engineers have developed a special air cushion with an internal reflecting element. This cushion inflates and takes the shape of an almost perfect parabolic “trough,” which has higher concentration of sunlight if we compare it with traditional systems of mirrors. As the most massive part of the concentrating installation is built on the spot, its costs turn to be much lower than the price of the concentrating solar power plants in use. The Airlight Energy’s engineers began the development of the CSP technology in 2007. At the same time, they worked over the concentrating solar photovoltaic elements (CPV) that have recently been successfully tested. Both CSP and CPV are ready for the industrial production. 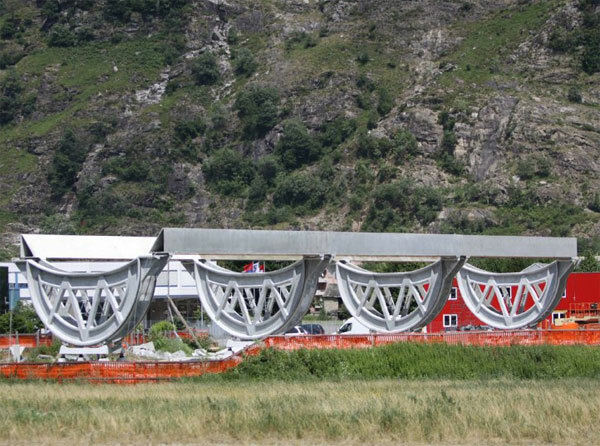 All the huge construction tilts on one axis following the movement of the sun across the sky during the day in order to maximize the capture of the solar energy. Each pneumatic mirror consists of the highly elastic transparent film ETFE on the front side and of the silicon fiberglass on the back side. The main component of the mirror is the flexible glassy foil located inside the mirror. The foil is made of a polyester film with aluminum coating. The mirror is pulled by several strong curves. According to the company’s press release, the air cushion protects reliably the mirror surface from dust and mud, thus maintaining its high concentrating ability. The cushion also helps to maintain the desired shape even when the system is exposed to strong winds.